Modernity gave rise to a Jewish consciousness that has increasingly distanced itself from the sacred in favor of worldliness and secularity. 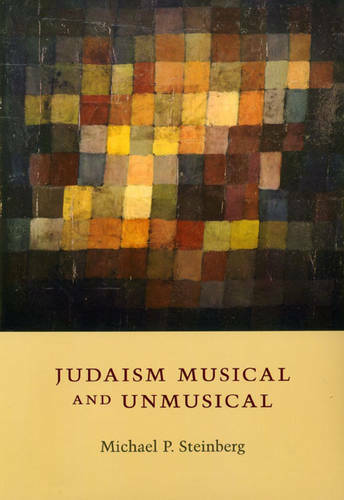 "Judaism Musical and Unmusical" traces the formulation of this secular Jewishness from its Enlightenment roots through the twentieth century to explore the infinite variations of modern Jewish experience in central Europe and beyond. Engaging the work of such figures as Sigmund Freud, Walter Benjamin, Hannah Arendt, Charlotte Salomon, Arnaldo Momigliano, Leonard Bernstein, and Daniel Libeskind, Michael Steinberg shows how modern Jews advanced cosmopolitanism and multiplicity by helping to loosen - whether by choice or by necessity - the ties that bind any culture to accounts of its origins. In the process, Steinberg composes a mosaic of texts and events, often distant from one another in time and place, that speak to his theme of musicality. As both a literal value and a metaphorical one, musicality opens the possibility of a fusion of aesthetics and analysis - a coupling analogous to European modernity's twin concerns of art and politics.